Storage for the media hungry. Western Digital has always been my go to manufacturer for storage. They’re consistently reliable, competitively priced and innovative. With the resources that are available these days, it’s not uncommon to have a vast media collection and everyone needs a place to store those files. With external hard drive storage capacities having a slow growth rate it’s tough to find a good solution without breaking the bank. Just under 2 years ago I dove into the world of NAS (network attached storage) and haven’t looked back since. Single drive external USB based hard drives are still the most popular option among consumers, but network storage is rapidly gaining ground as more options become available. This is the first line of products where Western Digital has offered a 0TB model alongside their main line, and I think it will do very well. Before the EX4 I had a 6TB MyBook Live Duo. It was very easy to set up and mostly configured itself. The first thing I would recommend when getting involved with multi-bay storage units like this is to learn about RAID configurations and storage options. It’ll save a ton of time and possibly accidentally losing data. I didn’t want to take any risks especially with the irreplaceable data that I was storing. The drive-less 0TB option on the EX4 is fully customizable, but has to be set up manually which brought a little learning curve with it. I had the 2 3TB drives from the Live Duo, a 3TB drive that was in my PC doing nothing, and then I had purchased a 3TB Western Digital RED drive (built for network servers) specifically for this unit which brought the total to 12TB across 4 drives. 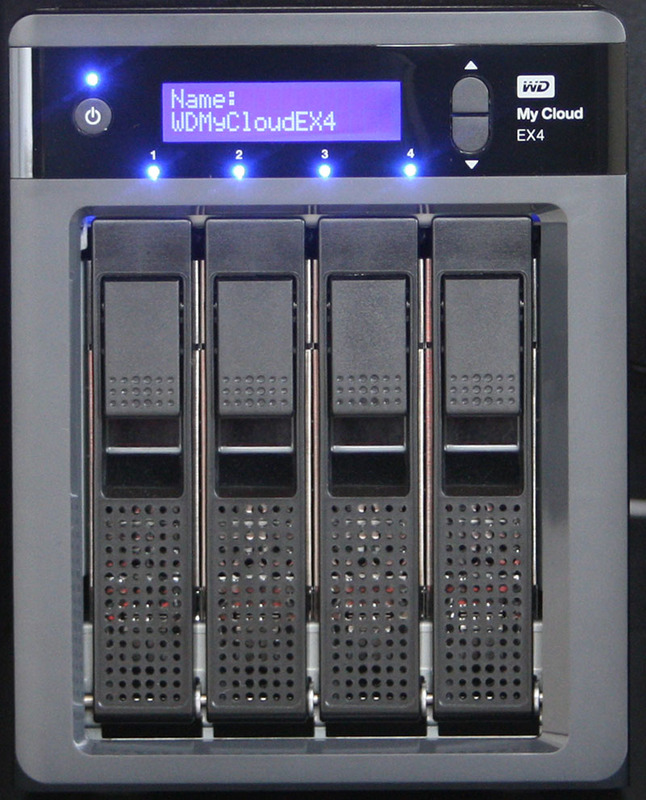 It has the capability to have 4 4TB drives to bring the total to 16GB. One thing I had a hard time finding that I’ll share in this review is that if you do chose to go with one of the built-in storage options it comes in 4 2TB red drives (8TB model), 4 3TB red drives (12TB model), and 4 4TB red drives (16TB model). 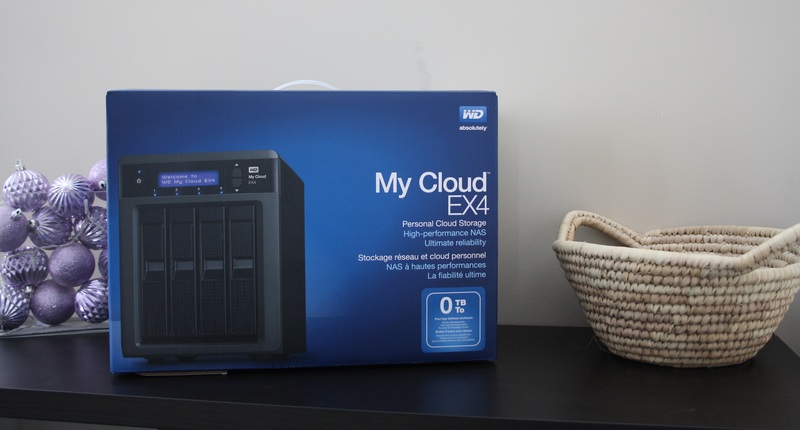 The My Cloud EX4 has an incredible design factor to it – I actually almost mistook it for the DX4000 which was a previous model that didn’t have a 0TB configuration. 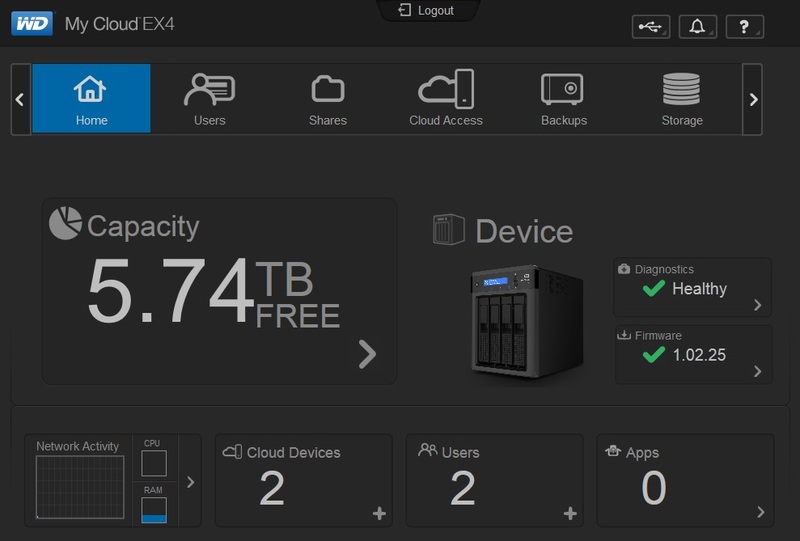 The EX4 has a bright display on the top of it that gives you detailed information such as device name, IP address, RAID status and drive health. Configuration any way you want to splice it. The bay doors unclip downwards and the drive slides out. They can be swapped without needing to power down the machine. The blue light above the drive signifies there is a drive present and blinks when it is being accessed. One thing I really like over the previous model I had is that there is a physical power button that can be held down and the system will shut down properly. Before I had to log into the dashboard and shut it down remotely. On the rear of the EX4 it has 2 Gigabit Ethernet ports, as well as 2 AC power ports. They’re used in case of one failing; it has a backup ready to go. Very useful in environments where data is being accessed at all times of the day and requires extreme reliability. I have the EX4 set up in dual RAID 0 mode, which means it’s split up into 2 6TB configurations. The reason it’s set up like that is so there are two separate combined volumes to organize media content more efficiently. There is an option to have it as one massive 12TB combined drive, but I chose against it because if a drive should fail I didn’t want all the data to be lost. This is of course all personal preference. It was impressive to see that the EX4 is capable of handling any type of configuration desired. Connectivity everywhere. But just for you. Western Digital has an app for iOS and Android where you can remotely log into your network drive anywhere around the world and access your information. They label it as your own personal cloud storage that never has any fees. The times I used the app it worked great, but some of the content I have wasn’t compatible (MKV files). For office documents, photos and other file types it’s a very easy way to keep everything organized and not need a 3rd party cloud service to sync and access your content. I use Plex Media Server to control all my media content remotely, and it can be installed and set up along with iTunes server to share and have direct access anywhere around the world. It’s by far the best setup I’ve ever had, everything just works as it should. With having the EX4 connected directly to the router and not a computer, its available 24/7 without needing to have a computer on. As long as the network is active it’s flawless. The web dashboard (above) is a huge improvement over the one included with the Live Duo. It has detailed information including processor usage, network activity, diagnostics, health and a lot of configuration options. There are many advanced options for FTP servers and other types of remote access, as well as full DLNA support. Setting up secondary users is also convenient if you want to give a family member access or if you have encryption setup on the drives it allows you to make a guest account who can only see certain drives or nothing at all. The drive can be used to back up computers or even backup itself using an internal drive or another drive on the network. Like most new products, there are still some bugs to iron out with the dashboard, but from a hardware standpoint Western Digital has everything in place. The EX4 will be my main network server for a long time, as I will simply upgrade the drives inside when the time comes. I always say to everyone that if a fire or earthquake was to ever happen and I could only carry one thing out, it would definitely be the Western Digital EX4. People store their entire lives on hard drives these days, and I feel completely secure storing everything I own on this device.